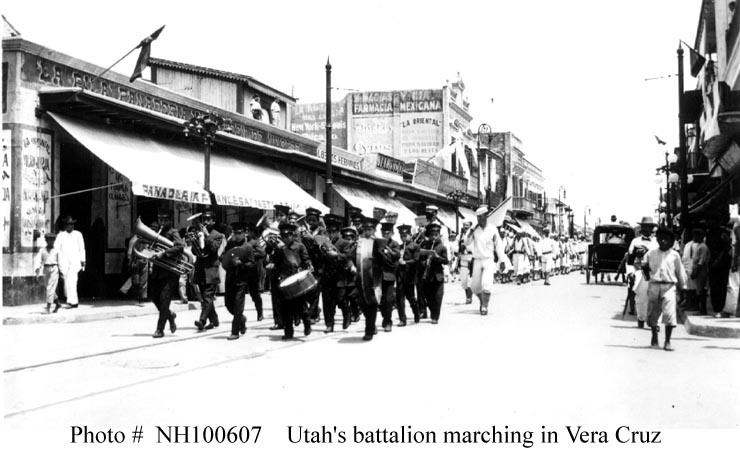 This is the third of a three part series on the American occupation of Veracuz in 1914. The first and second installments can be found here and here. 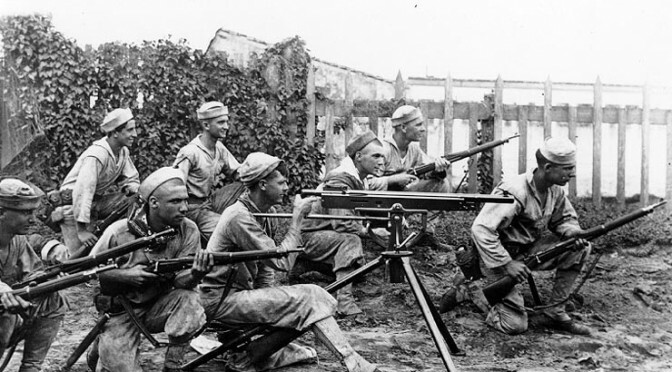 24 April marked the end of the combat phase of the U.S. invasion of Veracruz, with the “ABC Powers” of Argentina, Brazil, and Chile offering to mediate between the U.S. and Mexico. President Wilson agreed to participate in these talks and ordered the troops ashore to refrain from offensive operations. The negotiations proceeded to drag on even though one of Wilson’s original objectives behind the operation was was met in July when Mexican President Victoriano Huerta resigned. However, negotiations with Venustiano Carranza, the head of the Constitutionalist opposition to Huerta who then took power, proved to be not particularly fruitful either, with the parties only coming to a satisfactory agreement for the withdrawal of American troops in November. 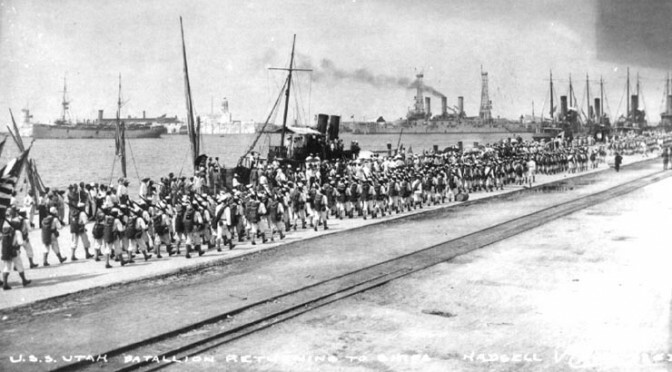 Of note, the other main reason for the invasion, preventing the delivery of the weapons onboard Ypiranga to Huerta’s army, was never achieved and did not matter regardless, as they were eventually delivered (the Americans let the ship leave Veracruz in early May and deliver its cargo at Puerto Mexico), but Huerta resigned before they could have any impact on helping the Army keep him in power. While U.S. memories of Veracruz are almost non-existent today, it had a massive and lasting impact on Mexican attitudes towards its northern neighbor. In Jack Sweetman’s the Landing at Veracruz: 1914, he describes the occupation as “a kind of Caribbean Pearl Harbor.” Even the Constitutionalists fighting against Huerta opposed U.S. military intervention in Mexican affairs, with Pancho Villa the only leading figure in Mexican politics who did not oppose the U.S. landing, ironic in light of him being the main target of another U.S. invasion a few years later. Just as the niños heroiques of 1847 entered the pantheon of national heroes, martyred defenders of the Naval Academy like Cadet Virgilio Uribe and Lieutenant Luis Felipe José Azueta are remembered to this day. A new adjective was added to the title of the Naval Academy, now known as the Heroica Escuela Naval Militar in honor of the cadets’ resistance to the norteamericano invasion. This year the Mexican Navy is participating in a months-long series of events to mark the centenary of an event that the service actually played little part in. Whether or not the Veracruz operation was a success is difficult to determine. Huerta was forced from office, but one would be hard pressed to prove that the American attack against Veracruz caused his removal. It did not end the Civil War, with Mexico undergoing several more years (or decades, depending on when one believes that the Civil War actually ended) of chaos and violence. A prominent event in Mexican history, it remains mostly a source of obscure service lore to Americans. This is the second installment in a three part series on the American occupation of Veracuz in 1914. The first article can be found here. On the morning of 21 April 1914, Rear Admiral Frank F. Fletcher, commander of the U.S. Navy task force offshore Veracruz, Mexico, complied with the order he had received from from Secretary of the Navy Josephus Daniels the night before. Fletcher ordered the landing of 1200 Marines and sailors from his ships to seize the customs house in Veracruz in order to prevent the delivery of the weapons onboard the German freighter Ypiranga to the Mexican Army, even before he was reinforced by ships commanded by his counterpart off Tampico, Rear Admiral Henry T. Mayo, and the Atlantic Fleet’s steaming from Norfolk. According to John Eisenhower’s Intervention! The United States and the Mexican Revolution, the Americans anticipated resistance from the Veracruz garrison of 600 soldiers, and 2000-3000 other Mexican troops in the region that could be augmented by militia and freed prisoners. Fletcher hoped that moving ashore quickly would preempt a defense by local troops, enable a potential occupation, and allow him to avoid using his ships’ big guns to obliterate the city. According to another account of the Veracruz operation, Jack Sweetman’s the Landing at Veracruz: 1914, the “Naval Brigade,” commanded by Captain William Rees Rush, the commanding officer of USS Florida, was composed of two regiments: the First Marine Regiment (22 officers and 578 men assembled from Marines onboard Fletcher’s ships) and the First Seaman Regiment (30 officers and 570 sailors from Florida and USS Utah). They went ashore from their ships anchored in the harbor onboard whaleboats towed by motor launches to Pier Four in the port. As soon the landings started, the American consul in Veracruz telephoned General Gustavo Maass, the local Mexican commander, encouraging him not to fight back and allow the Sailors and Marines to come ashore unopposed. Maass, in a rage, instead immediately informed 100 men from a regiment billeted nearby to engage the Americans. After a conversation with the Minister of Defense, Maass was forced to reverse himself, however, as the Minister instructed him to withdraw his troops ten miles inland to the town of Tejería. The Mexican Army’s involvement in the fight thus almost immediately ended, with the bulk of resistance over the next few days conducted by Veracruz’s civilian residents, who had some military training and organization as a militia (the “Society of Defenders of the Port of Veracruz”) as part of a program Huerta had implemented the previous year. That same morning, Ypiranga was sighted steaming towards the harbor and was interdicted by crew from USS Utah. The master cooperated and provided shipping documents to the boarding team, which ironically showed that the weapons on the ship had not originated in Hamburg, but were Remingtons made in the U.S. that had been routed through Europe to evade Wilson’s embargo on arms exports to Huerta’s army. With the Mexican Army out of the fight, one of the main sources of resistance left was from the Naval Academy, where cadets fired at the at the Americans landing at Pier Four. They emulated the example of the niños heroiques, cadets at the Mexican military academy in Mexico City in 1847 who threw themselves to their deaths from the cliffs of Chapultepec to save the flag and avoid surrender to a previous generation of American invaders. The cadets defending the Naval Academy in 1914 soon joined the ranks of the honored dead after fire from the guns of Fletcher’s ships silenced their resistance (enabled by Chief Boatswain John McCloy, who drove the motor launch he commanded towards the Academy, fired against it to draw a response, thus allowing the location of the defending cadets to be spotted and engaged by the ships’ guns, an act earning McCloy his second Medal of Honor). Meanwhile, in Washington, Secretary of State William Jennings Bryan apologized to the German government for the unlawful detention of Ypiranga. Bryan, like President Woodrow Wilson and Navy Secretary Daniels was well known as a devout Christian with a pacifist reputation and opposition to the military adventurism of the previous Republican administrations in Latin America and the Philippines, but was ironically overseeing the violent invasion of one of the U.S.’s closest neighbors on remarkably flimsy grounds. By 23 April Admiral Fletcher had transferred his command ashore with most of the resistance having melted away, but, according to Sweetman’s account, was unable to convince any of the local authorities to restore some form of government, as a law passed in the wake of the 1862 French invasion of Mexico made holding “office under a foreign power occupying Mexican soil” a criminal offense. The official casualty figures by 24 April listed 126 Mexicans killed and 195 wounded (an amount probably significantly lower than the actual total, since these numbers were based only on wounded and dead recorded by local hospitals), with 17 killed and 63 wounded Americans. Although the Naval Brigade had been reinforced and occupied virtually all of Veracruz, Admiral Fletcher was concerned that the Mexican Army was massing up to 16,000 troops in the vicinity of the city, dwarfing the number of Marines and Sailors ashore, many of whom were also needed back on ship in case of future operations at sea. 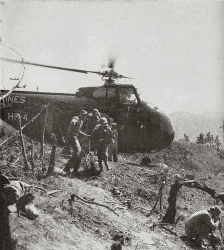 Therefore the U.S. Army’s Fifth Reinforced Brigade, commanded by Brigadier General Frederick Funston, was dispatched from the U.S. on 24 April, arriving a few days later. After negotiating the status of the Marines, the Army troops went ashore and took responsibility for the city from the naval units in a ceremony on 30 April (the debate over who “owned” the Marines foreshadowed future arguments over task organization in a joint force. 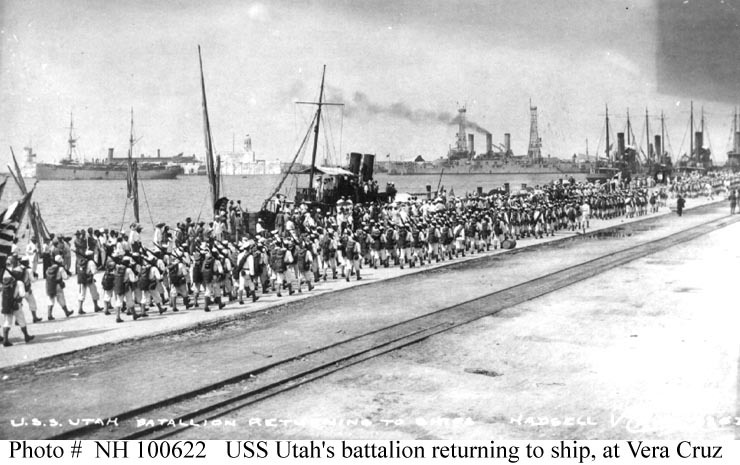 Ultimately the Marines that were attached to Navy ships returned to their afloat commands, while the rest of the force “chopped” to Army control). Despite significant support for a broader war with Mexico in the press and segments of Congress, Funston led an uneventful, combat-free, occupation of Veracruz for another seven months as the machinations associated with a diplomatic solution to the crisis were worked out. Stay tuned for the third and final installment of this series, which discusses the aftermath of the occupation. 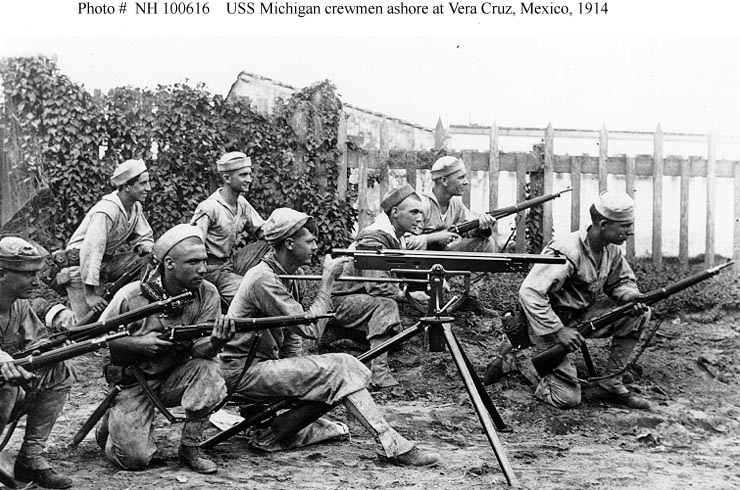 This April marks the 100th anniversary of one of the strangest episodes in the history of the U.S. Navy and Marine Corps, the mostly forgotten 1914 occupation of Veracruz. A relatively minor event during the lengthy and violent Mexican Revolution, it is also overshadowed by another American armed intervention in Mexico, the 1916 “Punitive Expedition” led by General John Pershing in pursuit of Pancho Villa. The Veracruz occupation is remembered, if at all, for the embarrassingly large quantity of medals awarded to its participants, and as one of the numerous “small wars” conducted by the Marine Corps in the late nineteenth and early twentieth centuries. The roots for the 1914 occupation of Veracruz started a few years earlier, in the chaos caused by the Mexican Revolution. Porfirio Díaz had ruled Mexico as a dictator since the 1870s (re-elected as President through periodic sham elections), but was finally forced from office in 1911 in the face of an opposition coalition that represented the whole spectrum from liberals to warlords and bandits. His successor, the aristocratic but principled liberal Francisco Madero, was soon overthrown and murdered during a 1913 coup led by General Victoriano Huerta, who proceeded to declare himself President. The U.S. first began creeping towards possible military intervention in Mexico in 1911, with President Taft instructing the Army to create a “Maneuver Division” for use in potential contingencies south of the border. Madero’s death during the Ten Tragic Days (La Decena Trágica) of February 1913, weeks before Woodrow Wilson’s inauguration following his defeat of both Taft and Theodore Roosevelt in the 1912 election, resulted in the deployment of U.S. Navy ships to ports on both the east and west coasts of Mexico to observe the situation and protect American citizens and interests. A month later, in March 2013, Venustiano Carranza established the “Constitutionalist” opposition to Huerta’s government by bringing together another coalition of liberals, regional leaders, and warlords/bandits. By the next spring, Constitutionalist forces had made their way to the vicinity of Tampico, where there was a substantial American presence (mostly due to Tampico’s central role in the Mexican oil industry). Rear Admiral Henry T. Mayo commanded the U.S. Navy forces offshore Tampico. The direct cause of the U.S. seizure of Veracruz was enabled by the convergence of the U.S. Navy and Constitutionalist army on Tampico. On 9 April 1914, personnel from USS Dolphin were mistakenly and briefly detained by Mexican soldiers (Federales loyal to Huerta) while buying fuel from a warehouse along the river near the front line between the two opposing Mexican armies. Although the Mexican General in command of Huerta’s forces quickly released the American sailors and apologized, Mayo would only be appeased by the Mexicans giving a 21-gun salute to the U.S. flag after it was raised ashore in Tampico; a stipulation that would be unacceptable to any Mexican patriot. In the following days, tensions were also raised by additional minor insults to U.S. honor, including the arrest of a “mail orderly” from USS Minnesota ashore in Veracruz, and the detention of a courier working for the embassy in Mexico City. 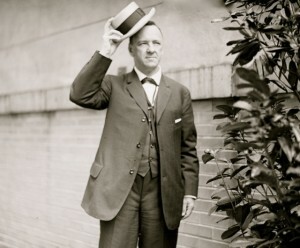 In response, on 14 April, President Wilson, whose personal and political distaste for Huerta and his manner of assuming power in Mexico was well known, ordered that the entire Atlantic Fleet immediately proceed from Norfolk to Mexico’s Gulf coast. By 20 April the stakes had been raised even higher, as the President secretly informed a small group of Congressional leaders that he had been informed by the U.S. consul in Veracruz that a shipment of arms for Huerta’s army was on its way to Veracruz onboard a German cargo ship, Ypiranga. Although Wilson wished to ask for congressional authorization for the use of force against Mexico, he did not wish to publicly disclose his knowledge of the Ypiranga shipment. 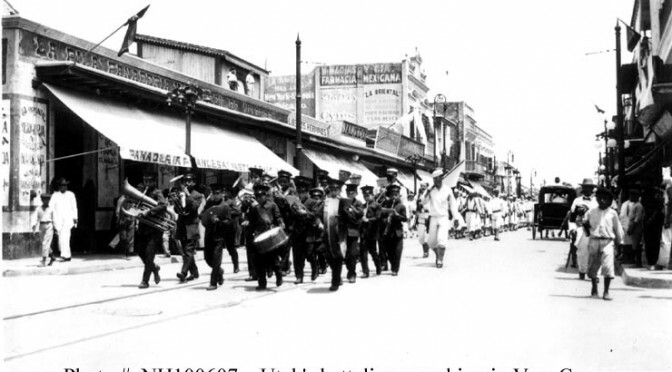 This is the first of a three part series on the 1914 invasion and occupation on Veracruz.